"Burninate" token, awarded by Jbribeiro1. "Like" token, awarded by Amire80. Alternate entries used for later post T208077#4699907. When I click on "Edit links"
And I chose the entry for "Kategori:Avlidna 107"
And I click on "Lenk til side"
This reads "The page you have chosen is already linked at our item on our central data repository. Acknowledge the pages shown below as the ones you want to connect to this page." There are no listed pages to connect. This seems wrong, and somehow this gadget turns up this error message quite often now. Wild guess: the data structure has changed somehow with the last mediawiki rollout, and a test in the gadget fails. Ie. the root cause is in the data structure, not the crappy message in the gadget. It is a thread at w:no:Wikipedia:Torget#Trøbbel med å koble til wikidata. I'm seeing the same problem in Commons, when I tried to link a page to ptwiki, but for me doesn't appear any wrong message, and the script was charging infinitely. A thing that was reported on ptwiki village pump (discuss) was that this pages didn't have entities on Wikidata, and the script should to create it when linked the pages, what happened in past. Same problem here: trying to link [[:Commons:Category:Palazzo Mandosi Mignanelli]] to [[:pt:Palazzo Mandosi Mignanelli]] with no success. Calling wb.sites.getSites() from an nowiki page only returns the pedias, whereas calling from wikidata we actually get all sites. matej_suchanek added subscribers: Robby, Roy17, Lydia_Pintscher and 2 others. I managed to make the edit that was described in the task description. Sorry, but the bug persists. Try to connect w:no:Kategori:Kolosserbrevet through use of w:en:Category:Epistle to the Colossians. Could it be a caching issue? Hmmmm, yes with this example I seem to still be getting an error. It seems this is a different issue to the other 2 tickets linked above. Note jQuery.Deferred exception: site is null… Sounds pretty similar, but I don't know. Very strange that the bug disappeared on the first page, but not on this one. What did we do during testing that we did not do on this page? 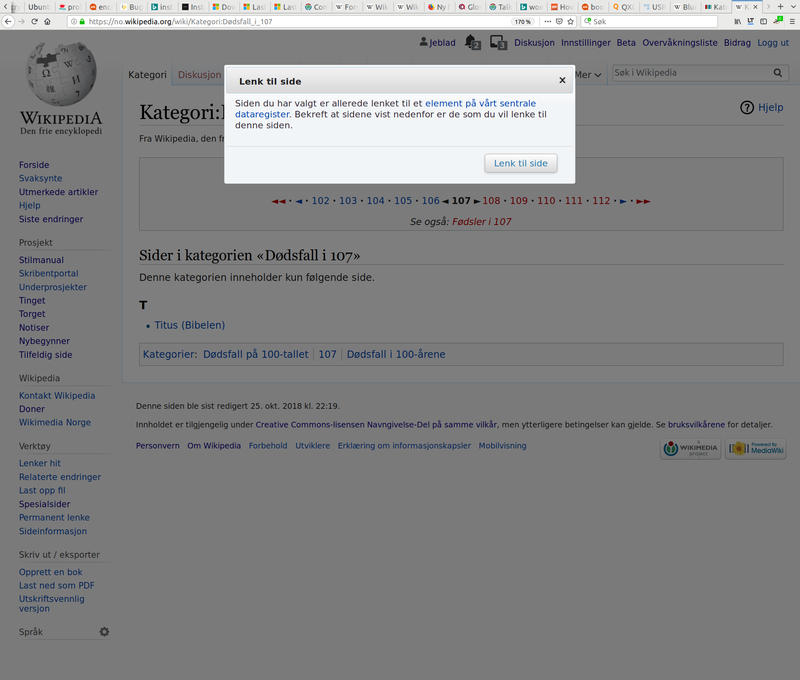 Tried a local save of the page at nowiki and a purge of the item at Wikidata. 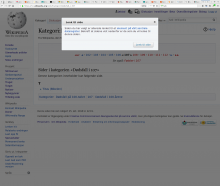 • Addshore merged a task: T208048: [BUG] Sidebar interwiki linking failed. • Addshore added subscribers: Traveler100, ARR8. I no longer get this error while testing with https://no.wikipedia.org/wiki/Kategori:Kolosserbrevet, please re open if this still happens for you. @Addshore Have you actually changed anything since T208077#4699907 ? Connecting Kategori:Kolosserbrevet did not work after your previous fix, and I'm a bit uneasy about closing this report without really knowing the category suddenly work.